RhinoCAM-ART is included in all configurations of RhinoCAM-MILL free of cost! RhinoART, also known as RhinoCAM-ART, is a module available for use with RhinoCAM. It is also included with all configurations of RhinoCAM-MILL for no additional cost. RhinoART is an unique design tool that can open up a lot of possibilities in the areas of jewelry design, 3D modeling, sign making, model making and other kinds of artistic modeling. By converting artwork into geometric shapes that are suitable for machining, RhinoART helps you bring your artistic ideas from 2D into 3D reality with a high degree of accuracy. Our RhinoART software works well with the CAD geometry used in the creation of your designs. 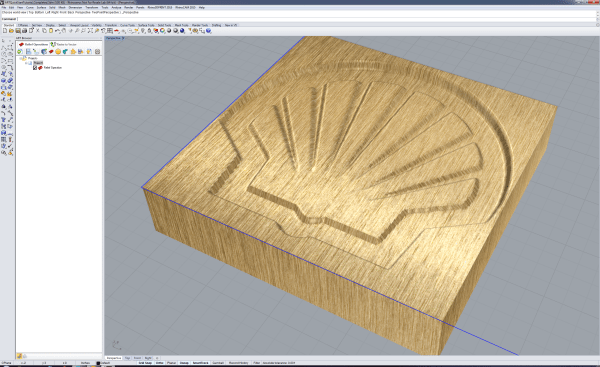 The Shape Library functionality also makes it easy to save the 3D volumes you create for later use. With its ease of use and wide range of functions, RhinoART is the 3D design tool you’ve been waiting for to create the most accurate 3D images and models from your original 2D artwork. To learn more about this 3D modeling and rendering software, you can use this page to request a Free Demo Download, view the specs, or watch a feature presentation overview by clicking the Resources tab. You can also simply click the “Buy Now!” button if you’re ready to get started with RhinoART software. We understand that our software is important and mission-critical for many of our customers, and we are here to offer excellent support whenever you need it. We offer Resources and Support Forums in addition to direct technical support via phone or email, so you can always find the information and help you need to get the most out of RhinoART and all other MecSoft products. The table below summarizes the various features found in RhinoCAM-ART.